Read almost any rock rag, and you can find those words used in reference to any singer, picker, or band that existed more than 10 or 15 years ago. Eddie Money is a legend! The legendary Stone Temple Pilots! The living legend, Little Peggy March! I’ve railed about this in the past and cautioned several younger writers to avoid it. If you want to write about legends, do a book about Paul Bunyan, Robin Hood, or Johnny Appleseed. 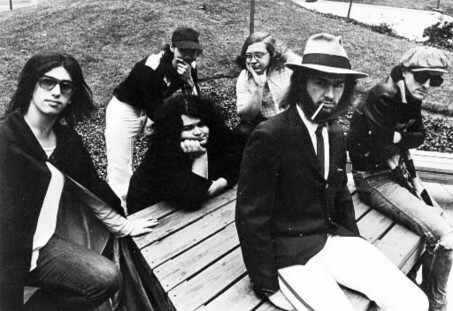 So here I am now about to explain to you that a certain Cleveland band from the ’70s is kind of a (gulp) legend — or at least was for several decades. I’m talking about Rocket From the Tombs, a highly influential proto-punk band that included singer David “Crocus Behemoth” Thomas, later of Pere Ubu; guitarist Gene O’Connor, better known as Cheetah Chrome, who would join The Dead Boys; and the late punk-rock forefather Peter Laughner, also an early member of Pere Ubu. Not only did Rocket hive off into two great bands, the group inspired an unrelated but very cool band across the country, San Diego’s Rocket From the Crypt, to take its name — kind of. The reason I’ll break my own rule and use the “L” word here is because for 30 years or so after the band broke up — after being together about eight months — all anyone ever knew about Rocket From the Tombs was through word of mouth. There were scattered bootlegs, but the band never recorded a proper album during its brief existence in the mid-’70s. Those who never saw the group live and couldn’t find the boots just had to imagine how the band sounded. You had to create the Ubu/Dead Boys convergence music in your mind. And tell your friends about it. Thus, a legend was born. It might sound harsh, but I’d argue it was at this point that Rocket ceased to be a legend. Though the group had been defunct for decades and though the release was barely publicized and basically ignored by the mainstream media, Rocket’s music was now accessible to anyone who knew how to search for it. Rocket no longer existed only in the mists of legend. Apparently that album sparked something. Original members Thomas, O’Connor, and bassist Craig Bell got together with Richard Lloyd (from the band Television, which was lege ... oh, never mind) filling in for Laughner and drummer Steve Mehlman for a Rocket reunion tour in 2004. 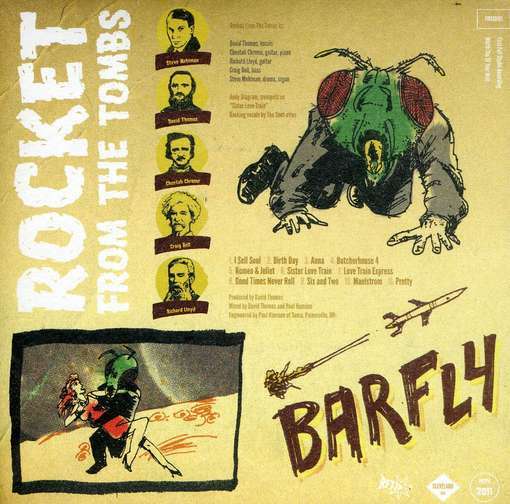 That tour resulted in an album called Rocket Redux, consisting of ancient RFTT classics recorded in the studio. Finally, late last year, the 21st-century version of Rocket From the Tombs brought the world Barfly, a studio album with a bunch of new songs. And it’s a decent effort. The album starts out strong with a song called “I Sell Soul.” Mehlman is storming on the drums while Thomas croons in his trademark warble, and O’Connor and Lloyd play showdown riffs. The band slows down a bit with “Birth Day,” which, without Thomas’ vocals, would actually sound more like a Television song. “Six and Two” is another one in which Lloyd’s Television influence really comes out. My favorite tracks on Barfly are the crazy rockers. “Anna” falls into this category. So does the minor-key “Maelstrom,” which starts out with a guitar hook that has echoes of original Rocket killer “30 Seconds Over Tokyo.” You can hear a nod to The Velvet Underground in “Good Times Never Roll.” Like the song that precedes it, “Butcherhouse 4,” there’s a pervading blues-rock vibe. One of my favorite songs is one that’s so good that Rocket included two versions. “Sister Love Train” (and the nearly identical “Love Train Express”) is a soul-infused tune. The main version is fortified by a horn section, while “Express” is a rawer, fast and furious guitar-dominated take. Even the original Rocket didn’t play at breakneck speed all the time. The current band slows it down with “Romeo & Juliet” and “Pretty,” which starts off with a guitar lick that reminds me of (I’m not kidding) The Band. “Romeo & Juliet” seems plodding at first, but eventually some intense guitar solos emerge. As you might have gathered, I like this album. It’s good rock ’n’ roll with some catchy tunes. 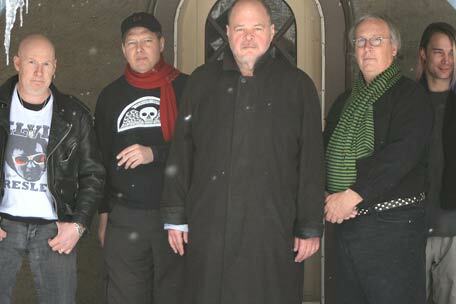 If you like the music of Pere Ubu, The Dead Boys and/or the original Rocket From the Tombs, definitely buy it. But it would be a stretch to call Barfly innovative and an even bigger stretch to call it anything close to dangerous — or even adventurous. The original Rocket was all those things. I guess it’s nearly impossible to live up to a legend. For $10 you also can download a 1974 Rocket From the Tombs concert (Extermination Night) . Don’t cry for me ’cause I’m going away. But I’ll be back some lucky day: Because of a vacation and a hot date with a surgeon, this is my last column for a few weeks. Please don’t cancel your subscriptions! But I will be blogging next week from South by Southwest. I haven’t been for four years, and for the first time I’ll be there without a press pass, so it should be an adventure. Watch this blog!